Here we go again! TGS 2008 is gearing up for what will clearly be yet another great event with 180,000 expected delegates attending the show which runs October 9-12 at Makuhari Messe. Organized by the Computer Entertainment Supplier’s Association (CESA), this ‘must see’ tradeshow estimates 170 exhibitors will fill 1,550 booths with nothing but the best in next-generation gaming products. See our video coverage from 2007 Here. 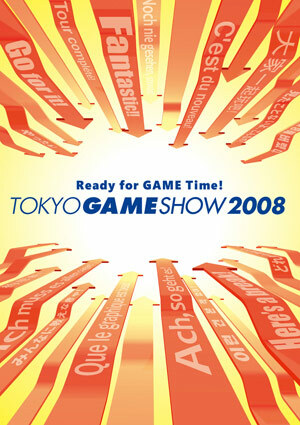 In keeping with this year’s theme, “Ready for GAME Time!”, which reflects the organizers’ wish that everyone enjoy games through the Tokyo Game Show 2008 to their hearts’ content, the main visual uses vivid colors in a bold composition to express the feelings of expectation, enthusiasm and excitement that people from around the world have toward the Tokyo Game Show. The main visual graphically expresses the impression of the Tokyo Game Show as a global computer entertainment show where a great many people gather not only from Japan but from all around the world, as well as the dynamism of excited vectors converging from across the world and excitement filling every corner of the venue. Of course Wireless Watch Japan will be on-hand for the 7th year in a row!